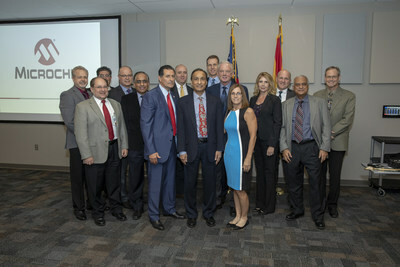 CHANDLER, Ariz., Nov. 28, 2018 /PRNewswire/ -- The recently released Defense Industrial Base Report, "Assessing and Strengthening the Manufacturing and Defense Industrial Base and Supply Chain Resiliency of the United States," highlights a number of issues of concern to companies that serve the U.S. Department of Defense (DoD). In support of tackling these concerns, Congresswoman Martha McSally, a member of the House Armed Services Committee, recently visited the corporate office of Microchip Technology Inc. (Nasdaq: MCHP), where she met with company executives to learn more about how Microchip is addressing the semiconductor supply chain vulnerabilities detailed in the report, and how other U.S.-based corporations can follow suit. "We appreciate Congresswoman McSally taking her time, as a highly respected member of the House Armed Services Committee, to discuss the steps Microchip has been taking to address issues related to supply chain vulnerabilities in today's global economy," said John Costello, vice president of government relations for Microsemi, a wholly-owned subsidiary of Microchip Technology. "It's reassuring to know Microchip initiatives are well aligned with the recommendations made in this report," said Steve Sanghi, chairman and chief executive officer of Microchip. "Our onshore capabilities combined with our vast military and aerospace market experience can address foreign semiconductor dependence, and we will continue to focus on this important issue for our industry and the United States." Microchip, via its recent acquisition of Microsemi, is one of only a few companies capable of delivering trusted integrated circuit solutions that can be leveraged in today's critical applications requiring assurance of silicon design and manufacturing as outlined in the Department of Defense (DOD) policy, DODI 5200.44. DODI 5200.44 further defines the protection of mission-critical components within applicable systems by requiring all custom integrated circuit-related products be procured from a trusted supplier. In addition to the meeting with company executives, Rep. McSally joined Sanghi at a ribbon-cutting ceremony for a new building at Microchip's Chandler headquarters. During her visit she also hosted a town hall session with employees, where she took several questions about the Defense Industrial Base Report and related issues. Note: The Microchip name and logo and the Microchip logo, are registered trademarks of Microchip Technology Incorporated in the U.S.A. and other countries. All other trademarks mentioned herein are the property of their respective companies.